Today you will arrive at Delhi’s International Airport. Following customs, immigration formalities and baggage collection, our representative will meet you as you exit the arrivals terminal building and transfer you to your hotel. Your guide will meet you in the hotel lobby, to review the suggested itinerary and plan the pace and inclusions of your days. Today, discover Delhi in all its majesty. You will visit Jama Masjid – the largest mosque of Asia, followed by a private tricycle rickshaw ride through the lanes of Chandni Chowk, also known as Silver Street. Next we shall drive past the mighty Red Fort, built by the Emperor Shah Jahan – the builder of Taj Mahal. Conclude the tour of Old Delhi with homage to the father of the nation – Mahatma Gandhi at Raj Ghat – the memorial. The discovery of New Delhi starts with visit to Qutub Minar which is Delhi’s Eiffel Tower, its Statue of Liberty and Nelson’s Column. Visit the mosques, mausoleums and ruins of forts that lie around it. Continue onto Humayun’s Tomb set in beautiful gardens. This Mughal creation popularized Persian–influenced architecture was an inspiration for the Taj Mahal. Our drive back to the hotel will be through one of the most colonial part of New Delhi called Raisina Hill. 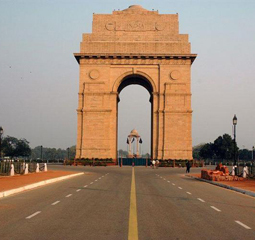 Drive past the Presidential House and India Gate – a war memorial arch. In time our representative will meet and transfer you to airport to board flight for Udaipur. Arrive Udaipur, meet upon arrival and transfer to hotel. Udaipur – The Venice of the East. 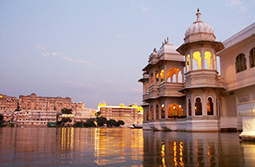 Udaipur often called the “Venice of the East” and the most romantic city in the state of Rajasthan. Udaipur nestles like a gem in a valley surrounded by green hills, reflected smooth and white in the clear blue waters of Lake Pichola. The city is a kaleidoscope of narrow lanes flanked by bright stalls, gardens, lakes, palaces and temples. On arrival proceed for check in hotel. After buffet breakfast at hotel proceed for drive to Jodhpur enroute visiting Ranakpur Jain Temples. Ranakpur Jain Temples – set on the shores of Lake Pichola and surrounded by hills, Udaipur grew in complete contrast to the harsh deserts of the rest of Rajasthan. As capital of the old Mewar State it was the only Rajput stronghold to uphold its Hindu allegiance in the face of Muslim invasion. After visit continue your drive to Jodhpur. The old city of Jodhpur is surrounded by a wall 10km long, which was built about a century after the city was founded. From the fort you can clearly see where the old city ends and the new begins. The old city is fascinating jungle of winding streets of great interest to wander around. On arrival proceed for check in hotel. North of Mehrangarh Fort, and connected to it by road, Jaswant Thada is a pillared marble memorial to the popular ruler Jaswant Singh II (1878–95), who purged Jodhpur of dacoits, initiated irrigation systems and boosted the economy. After sightseeing proceed for drive to Jaisalmer. Jaisalmer, the golden beauty etched in yellow sandstone, standing tall against miles of gleaming sand. Founded in 1156 AD by Maharawal Jaisal, Jaisalmer’s location kept it almost untouched by outside influences and even during the days of the Raj, Jaisalmer was the last to sign the Instrument of Agreement with the British. Deep in the heart of the Thar Desert is Jaisalmer, one of the last princely bastions in the region. Upon arrival in Jaisalmer, proceed for check-in at your hotel. Later proceed for a city tour of Jaisalmer. You will walk up to The Fort, which dominates the town. Built in 1156, it is one of the oldest forts in Rajasthan. About a quarter of the old city’s population resides within the fort walls, which have 99 bastions around the circumference. Within the fort are a fine group of Jain temples built between the 12th and 15th centuries, many containing ancient manuscripts. Walk through Jaisalmer’s narrow streets dotted with ornately decorated Hindu and Jain temples. Later afternoon, you will be driven to Sam Sand Dunes for a camelback ride into the desert to watch the sun set on this golden desert city, emitting a lustrous glow off the desert sand. Camel Safari is one of the unique ways to explore small villages in Rajasthan. Atop this ship of the desert embark on an exciting soft adventure. 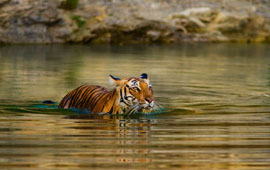 This safari is across India’s Thar Desert, one of the harshest environments in the world. Journey on camel backs to discover the great expanse of the desert and spend your time getting to know the colourful tribal people who have made these parched lands their home for centuries. Bikaner is popularly referred to as the 'Camel City of Rajasthan'. Bikaner lies on the ancient caravan routes that linked Western/Central Asia and North India with the seaports of Gujarat. Bikaner thus flourished as a major trade center during the medieval period. The kingdom of Bikaner was established by a Rathore Prince, Rao Bikaji, son of the founder of Jodhpur. The city is surrounded by great walls, and dotted with many sand dunes. Bikaner retains the medieval splendour the prevades the city’s lifestyle. More popularly called the camel country. the city is renowned for the best riding camels in the world. 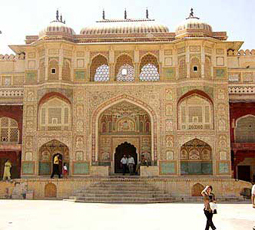 Later you will proceed for a sightseeing tour of Bikaner visiting Junagarh Fort, one of the most interesting forts in Rajasthan, with its sumptuously decorated interiors. Built in 1588 by Raja Rai Singh it is unusual in the sense that it was one of the few major forts of Rajasthan that was not built on a hilltop. Continue onto National Camel Breeding Farm and see the incredible sight of a herd of camels returning back after grazing, with the spectacular desert sunset in the background. Set amid rolling sand dunes, this farm is set up to produce superior strains of camels both for domestic haulage as well as, even today, for military use. After sightseeing you will be driven to Jaipur. Jaipur – City of Victory was founded by Maharaja Sawai Jai Singh II in 1727. It is the only city in the world symbolizing the nine divisions of the Universe through nine rectangular sectors sub–dividing it. The architect who formalized the city’s plans on the Shilpa Shastra, the epic Hindu treatise on architecture, mixed it with the sublimity of the Mughal and Jain influences of those times. The city was painted pink in 1853 in honour of the visit by Prince Albert. Except for the busy traffic of bicycles, cars and buses, little seems to have changed. Post Amber, our tour will begin with a photo stop at Hawa Mahal – the Palace of Winds, it has no less than 953 little windows and balconies, and it is a stunning example of Rajput artistry. It was originally built to enable ladies of the royal household to watch everyday life in the streets below through the delicately honeycombed sandstone windows. Visit the City Palace, now a museum, which was the former royal residence built in a blend of the Rajasthani and Mughal styles. It offers a superb collection of Rajasthani costumes and armoury of the Mughals and Rajputs. Proceed to Jantar–Mantar – the ancient Observatory which is acute even today..!! Post breakfast, you will be met by our driver who will take you to Jaipur. Enroute visit Fatehpur Sikri – the deserted red sandstone city, built by the Great Mughal Emperor Akbar as his capital and palace in the late 16th century. Fatehpur Sikri (the City of Victory) was the capital of the Mughal Empire for only some 10 years. It was abandoned soon after it was built when the local wells went dry and it remains today in much the same condition that it was over 300 years ago. It is complete with palaces and mosques and used to be a town larger than London when it was originally constructed. Visit the Panch Mahal, Diwan-i-Khas, Diwan-i-Aam, Jama Masjid & Buland Darwaja. After sightseeing, continue your drive to Agra – Medieval city situated on the banks of river Yamuna, mostly popular for Taj Mahal, the eternal monument of love. Early in the morning, you will proceed for the breath taking sunrise tour of the Taj Mahal (Closed on Fridays). Midway Tonga’s “horse carriages” would be waiting for you and will drop you at the gates of the Taj Mahal. The Taj Mahal, a UNESCO world heritage site was built in white marble in 1635 by Emperor Shahjahan as a mausoleum for his queen Mumtaz Mahal. It is a universal symbol of love, and one of the Seven Wonders of the World. Return to the hotel for buffet breakfast. Post breakfast after proceed for the sightseeing tour of Red fort popularly known as Agra Fort Construction of Agra Fort was originally started by Emperor Akbar in 1565, but his son, Jehangir, and grandson, Shahjahan, later made additions. It houses the Diwan-i-Khas and Diwan-i-Aam (Halls of Private and Public Audience) and its walls are a silent witness to the rise and fall of the Imperial Mughal Empire. After visit, you will drive to Delhi. Drop at International airport to board your flight for back home.